a muscular organ on the floor of the mouth; it aids in chewing, swallowing, and speech, and is the location of organs of taste. The taste buds are located in the papillae, which are projections on the upper surface of the tongue. The condition of the tongue can sometimes be a guide to the general condition of the body. glossitis (inflammation of the tongue) can accompany anemia, scarlet fever, nutritional deficiencies, and most general infections. Sometimes it is part of an adverse reaction to medication. One form of glossitis causes a smooth tongue, with a red, glazed appearance. A coated or furry tongue may be present in a variety of illnesses, but does not necessarily indicate illness. A dry tongue sometimes indicates insufficiency of fluids in the body, or it may result from fever. When the tongue is extremely dry and has a leathery appearance, the cause may be uremia. 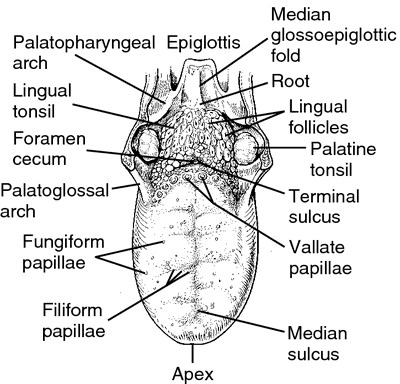 The tongue, showing principal structures. From Dorland's, 2000.
bifid tongue a tongue with a lengthwise cleft. black tongue (black hairy tongue) hairy tongue in which the hypertrophied filiform papillae are brown or black; called also lingua nigra, melanoglossia, and nigrities linguae. coated tongue one covered with a white or yellow layer of desquamated epithelium, debris, bacteria, fungi, or other material. fissured tongue (furrowed tongue) a tongue with numerous furrows or grooves on the dorsal surface, often radiating from a groove on the midline. geographic tongue a tongue with denuded patches, surrounded by thickened epithelium. hairy tongue a benign condition of the tongue characterized by hypertrophy of the filiform papillae that gives the dorsum of the tongue a furry appearance. The color of the elongated papillae varies from yellowish white to brown or black, depending upon staining by substances such as tobacco, foods, or drugs. raspberry tongue a diffusely reddened and swollen, uncoated tongue, as seen several days after the onset of the rash in scarlet fever. strawberry tongue, red raspberry t.
strawberry tongue, white the white-coated tongue with prominent red papillae characteristic of the early stage of scarlet fever; the coating desquamates, leaving a beefy red (raspberry) tongue. (tung) the movable muscular organ on the floor of the mouth; it is the chief organ of taste, and aids in mastication, swallowing, and speech. 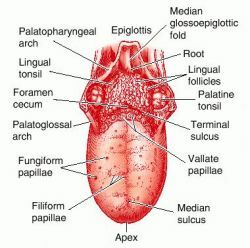 The tongue, showing principal structures. bifid tongue one with an anterior lengthwise cleft. black tongue , black hairy tongue hairy tongue in which the papillae are brown or black. coated tongue one covered with a whitish or yellowish layer consisting of desquamated epithelium, debris, bacteria, fungi, etc. fissured tongue , furrowed tongue a tongue with numerous furrows or grooves on the dorsal surface, often radiating from a groove on the midline; it is sometimes a familial condition. geographic tongue benign migratory glossitis. hairy tongue one with the papillae elongated and hairlike. raspberry tongue a red, uncoated tongue, with elevated papillae, as seen a few days after the onset of the rash in scarlet fever. red strawberry tongue raspberry t..
white strawberry tongue the white-coated tongue with prominent red papillae characteristic of the early stage of scarlet fever. the principal organ of the sense of taste that also assists in the mastication and deglutition of food. It is located in the floor of the mouth within the curve of the mandible. Its root is connected to the hyoid bone posteriorly. It is also connected to the epiglottis, soft palate, and pharynx. The apex of the tongue rests anteriorly against the lingual surfaces of the lower incisors. The mucous membrane connecting the tongue to the mandible reflects over the floor of the mouth to the lingual surface of the gingiva and in the midline of the floor is raised into a vertical fold. The dorsum of the tongue is divided into symmetric halves by a median sulcus, which ends posteriorly in the foramen cecum. A shallow sulcus terminalis runs from this foramen laterally and forward on either side to the margin of the organ. From the sulcus the anterior two thirds of the tongue are covered with papillae. The posterior third is smoother and contains numerous mucous glands and lymph follicles. The use of the tongue as an organ of speech is not anatomical but a secondary acquired characteristic. Also called glossa, lingua. lingua Anatomy A complex, highly mobile muscular organ anchored in the floor of the mouth, which is central to speaking, chewing, swallowing, is covered by a mucosae invested with tastebuds, is the main organ of taste, assists in forming speech sounds and, when used indisciminately, a major source of interpersonal problems. 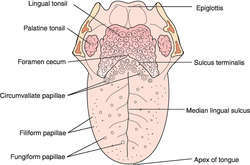 See Black hairy tongue, Coated tongue, Flycatcher tongue, Geographic tongue, Golden tongue, Hairy tongue, Liver tongue, Magenta tongue, Raspberry tongue, Scrotal tongue, Smart tongue, Strawberry tongue, White strawberry tongue. 1. A mobile mass of muscular tissue covered with mucous membrane, occupying the cavity of the mouth and forming part of its floor, constituting also by its posterior portion the anterior wall of the pharynx. It bears the organ of taste, assists in mastication and deglutition, and is the principal instrument of articulate speech. Synonym(s): lingua (1) [TA] , glossa. Synonym(s): lingua (2) [TA] . The muscular, mucous membrane-covered, highly flexible organ that is attached to the lower jaw (mandible) and the HYOID BONE in the neck, and forms part of the floor of the mouth. The mucous membrane contains numerous small projections called papillae. On the edges and base of the tongue are many special nerve endings subserving taste and called taste buds. a muscular organ on the floor of the mouth in most higher vertebrates that carries taste buds and manipulates food. It may act as a tactile or prehensile organ in some species. Mobile mass of muscular tissue covered with mucous membrane, occupying cavity of mouth and forming part of its floor, constituting also by its posterior portion anterior wall of pharynx; bears taste buds and assists in mastication, deglutition, and articulation of speech. n the muscular organ that is the main articulatory element in the production of speech and accounts for the clarity and fluidity of speech. Two groups of tongue muscles, the intrinsic and extrinsic, are united into one organ. Each group, however, has separate structural and functional characteristics. n enlargement of the tongue resulting from amyloidosis. n a glossitis caused by sensitivity to an antibiotic, vitamin B complex deficiency associated with antibiotic therapy. atrophic glossitis. See also glossitis, atrophic; glossitis, Moeller's. n a tongue divided by a midline cleft. n a black appearance of the dorsal surface of the tongue; caused by elongated filiform papillae and an accumulation of dark pigments, microorganisms, and food debris. n a narrow, wooden instrument used by the patient to clean the tongue. Can also be used during an examination to aid in inspection of the teeth, gums, and oral cavity. n nonspecific term used to describe the condition of the tongue resulting from whitish or otherwise discolored accumulations of food debris, bacterial plaques, and hyperplastic filiform papillae. Reduced function, as in general illness or laryngitis, is a primary cause. n hyperplasia and hyperemia of fungiform and filiform papillae of the tongue in riboflavin deficiency. Formerly used to describe syphilitic glossitis with leukoplakia. n an appliance used to limit undesirable tongue movements, usually constructed to prevent its protrusion between the anterior teeth. n.pl a flat wooden stick used to position the tongue so that the back of the throat may be seen. Several may be used together as oral cavity props. n a tongue traversed by clefts that may be arranged like the veins of a leaf or give the tongue a “pavement block” appearance. It is seen in 5% of all dental patients but in 13% of those older than 50 years. n paralysis of the transverse lingual muscles such that the borders of the tongue cannot be rolled. The condition results from congenital syphilis. 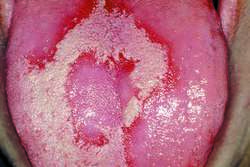 n (benign migratory glossitis, glossitis areata exfoliativa, glossitis migrans, wandering rash), a condition characterized by a chronic, circumscribed, more or less circular desquamation of the superficial epithelium of the dorsum of the tongue. The spots of desquamation (redder areas) migrate continuously, usually passing from the region near the vallate papillae toward the tip of the tongue. This condition involves the filiform lingual papillae. The tongue can seem more sensi-tive than usual during times of exacerbation. n hyperplasia of the filiform lingual papillae, often associated with oral moniliasis and the use of antibiotics or tobacco. n a congenital defect, with a secondary lobe of the tongue arising from its surface. n the reddish-purple tongue of riboflavin deficiency. n See crenation of tongue. n a deliberate pierc-ing of the tongue in order to wear tongue jewelry, which creates a high risk of life-threatening systemic effects, as well as dental abrasion, gingival recession, and fractured teeth, especially during athletic activities. n.pr a condition in which the tongue is very smooth because of a loss of fusiform papillae and is fiery red and enlarged because of severe inflammation; seen in pellagra. n an oral hygiene implement drawn down the tongue from the back to the front in order to reduce oral cavity odors and plaque-producing bacteria. n the space available for functioning of the tongue. n thrusting of the tongue between the anterior teeth, especially in the initial stage of swallowing. This action, often combined with a resting position also between the teeth, may inhibit normal eruption and produce an open bite. n hairy tongue characterized by elongation of the filiform papillae but without the dark staining seen in lingua nigra (black hairy tongue). See also tongue, black hairy. a muscular organ on the floor of the mouth; it aids in chewing, swallowing and speech, and is the location of organs of taste. 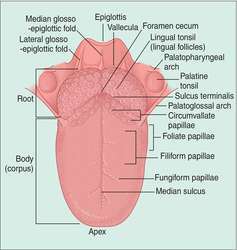 The taste buds are located in the papillae, which are projections on the upper surface of the tongue. as well as true abscesses there are pseudoabscesses, common in companion birds, which are accumulations of inspissated, keratinized, epithelial debris, caused usually by a nutritional deficiency of vitamin A.
a tongue with a lengthwise cleft. one covered with a whitish or yellowish layer consisting of desquamated epithelium, debris, bacteria, fungi, etc. the tongue may be shrunken because of prior inflammation, the tip may have been torn off, e.g. in lambs by predators. There is difficulty in prehending food and in managing in the mouth so that saliva and ruminal juices drool down the chin staining skin. Called tobacco chewers. caused by local obstruction to venous blood flow, most dramatically displayed in a fetus presented anteriorly but delayed in parturition because of incompatibility in size between it and the birth canal, or bee or other hymenoptera sting. a tongue with numerous furrows or grooves on the dorsal surface, often radiating from a groove on the midline. a tongue with denuded patches, surrounded by thickened epithelium. one with the papillae elongated and hairlike. an occasional congenital anomaly in pigs. one that protrudes from the mouth, usually to one side. Seen in some short-nosed dogs and as a vice in horses. caused by paralysis (hypoglossal nerve dysfunction), Phalaris spp. poisoning, swelling, e.g. edema, laceration. a vice in housed cattle. The animal rolls its tongue around in its half-opened mouth and may partially swallow it. Q. What is the treatment for tongue cancer? My Father in Law is 65 and has just been diagnosed with tongue cancer. What treatment will he be undergoing? What are his survival rates? Q. What is Tongue cancer? I heard that smoking can cause tongue cancer. Is this true and what is tongue cancer? A. Cancer of the tongue is a malignant tumor that begins as a small lump, a firm white patch, or a sore (ulcer) on the tongue. If untreated, the tumor may spread throughout the tongue to the floor of the mouth and to the gum (jaws). As a tumor grows, it becomes more life threatening by spreading (metastasizing) to lymph nodes in the neck and later to the rest of the body. The general term for this type of cancer is cancer of the oral cavity. Q. What are the symptoms of tongue cancer? I have a white patch on my tongue for quite a while. I tried scratching it off but it starts bleeding. Is it cancer? However, don't be alarmed as these symptoms may be due to a less serious medical condition. But it is important to check symptoms with your GP just to make sure.